Follow these tips to support your child’s writing at home. The area should be an area that is quiet and well lit. Stock the “writing centre” with supplies such as paper, pencils and crayons. You can also gather family photos and magazines in the centre that can be used as story starters. The best activity to improve writing is reading. If your child reads good books, he will be a better writer. Reading exposes students to general vocabulary, word study and content-specific vocabulary. 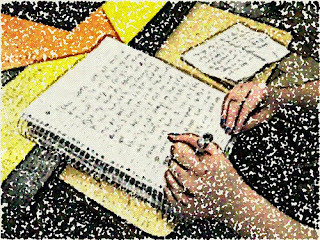 Through reading, students see a variety of authors’ techniques that they can use in their own writing. This is excellent writing practice, as well as a good outlet for venting feelings. Encourage your child to write about things that happen at home and at school. This reflective journal can be used to develop the “senses” of writing. Have your child write about what he saw, heard or felt on a trip or adventure. Provide experiences in your community that will interest your child and spark her writing. Especially encourage your child to write about personal feelings — pleasures as well as disappointments. When reading your child’s journal (only if your child invites you to, of course), share your own feelings and ideas paired with positive feedback about your child’s writing. Have your child write his own thank-you notes, party invitations and letters to family. Let your child make the grocery list. Finding a pen pal for your child would make writing “real.” Helping children make the connection between writing and the “real” world will increase interest in writing. Make sure your child sees you as a writer. Point out times that you use writing to communicate with others. Discuss authentic writing in the community such as articles and letters in the newspaper, on billboards or in written advertisements. Discuss the purpose of the writing and the target audience. When your child writes, you should write. You can schedule a day of the week that you will turn off the television and share your writing. Teach your child new words each week and encourage her to use them. Make it into a game and give points for using the new words. Your child can keep a vocabulary notebook and get rewarded for the number of new words learned. The words will begin to appear like magic in her oral language and writing. Share their writing with others, place it on the refrigerator or encourage them to write for kids’ magazines. When your child’s writing is published in a children’s book, they will be on her way to becoming a lifelong writer and author.